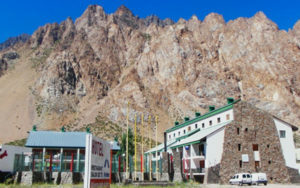 Our logistic base/hotel where your group will stay before going to the mountain is in Penitentes. It is situated 182 km from Mendoza. 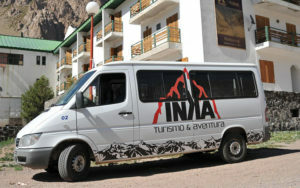 We have several comfortable mini buses for different size groups to transport the climbers through the mountain route. All our transfers are controlled and coordinated by ourselves so you can relax and enjoy the trip. We also have the ability to organize special transfer according to your needs and requirements. One of the most requested transfers is from Santiago, Chile to Mendoza City. We are able to organize this transfer for you with the best travel options available. Villa Penitentes is situated 182km from Mendoza City and sits at 2580 meters above sea level. It was called this name due to the rocky mountains surrounding that seem to be like priests doing penitence. As it is operated as a ski resort in winter, there are many options of accommodation such as a hotel, refuges and hostels. Your chosen option will allow for an excellent rest and good meals. We also have our Logistic Center in Penitentes. However the most important part is the due to the altitude it is the first step for acclimatization process.